Inspired by the boardwalk, the ocean and the many wildflowers. Moonstone Beach at Cambria is on the California’s Central Coast. A view of the ocean from my window, inspired this painting, and I painted most of it right there on my mini-retreat, alone, two weeks ago. Moonstone Beach Drive runs along the bluff with the view on one side and the hotels on the other. Cambria is our best, “close” place to make us “feel” far away. It is a 4 hour drive from home that seems much farther. The only man made thing between the drive and the beach side is a boardwalk (see it?) that runs the length of the beach on the bluffs, amidst sage, wildflowers and pines. I’m guessing it was originally built to encourage people to stay off the natural landscape, which it does, but there’s more to it's story…my story at least. 2005 - Things were fine then. I have walked this boardwalk with Gary before, and at those times gave it little thought, but on this solo trip, the wooden walkway was an inescapable connection to my husband. Memories of other days rolled over me like the nearby waves. Gary and I had walked along the bluffs many times. If the day was cold and misty, we had coffee in hand. If clear and sunny, we had sunglasses and trail mix. It was always refreshing or leisurely or inspiring, but whatever it felt like, it was shared. The wooden planks are frequented by runners and walkers, lovers strolling, surfers checking out the waves, tourists with binoculars hoping to see an otter or sea lion, and underneath are ground squirrels hoping for a treat. November 2011 - Middle stage dementia, but still enjoying the walk. We have been coming up here for many years. We love it here. Our daughter, Sarah and her husband Ryan, came along with us 2 1/2 years ago to help me with Gary. It would be the last time for Gary and I to be here together. I remember that during that trip to Moonstone, Gary enjoyed walking on the sand without anyone guiding him and at dinner, how much he enjoyed his salmon dinner fed to him by Ryan from across the table, as I sat next to him at Robin's Restaurant. It was a very special time. Right now, at this moment, the waves are breaking in rhythm. Someone is walking hand in hand along the bluff. I’m happy for them. I’m happy for us. 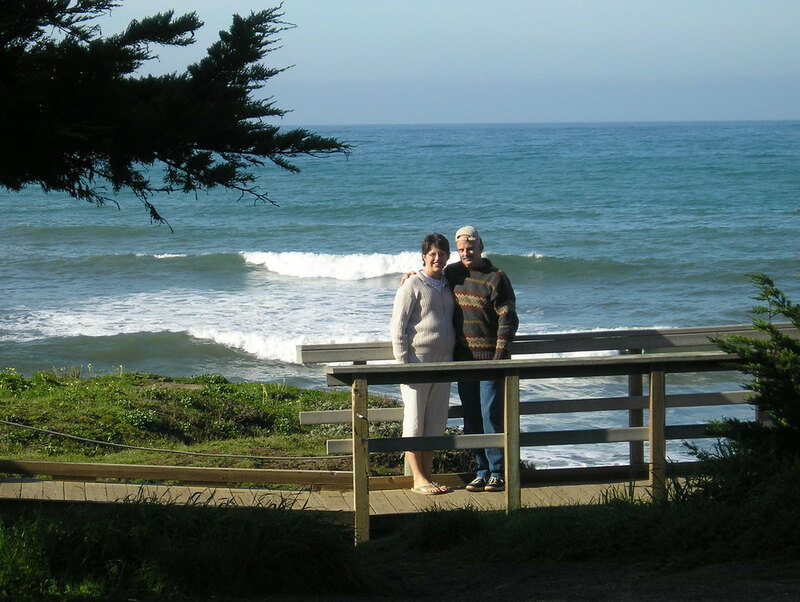 Moonstone Beach, Cambria, California - Walking with the Lord and very sweet memories.